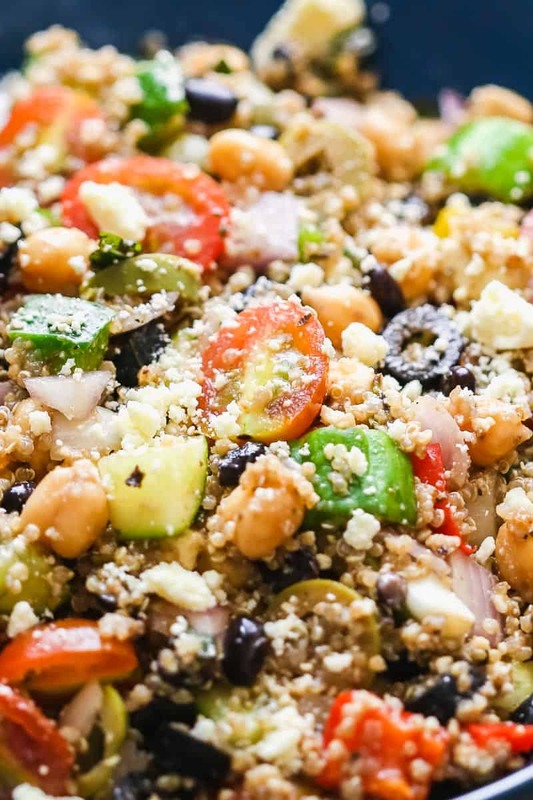 Mediterranean Quinoa Salad – Fresh and Healthy! 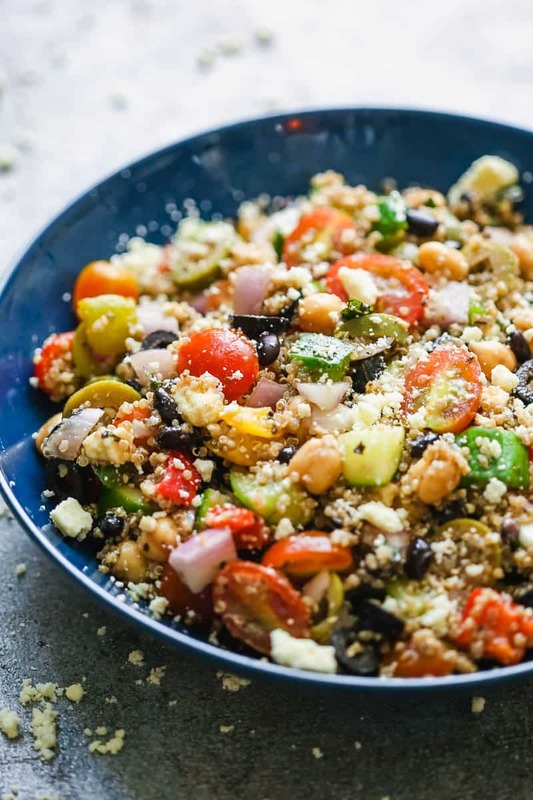 Mediterranean Quinoa Salad is a hearty salad thats loaded with quinoa, chickpeas, black beans, tomatoes and feta. Everything gets tossed in a healthy balsamic based salad dressing that makes this cold salad so irresistible. It’s one of those few salads that you should dress a few hours before and refrigerate to let the flavours mingle together. Healthy, gluten free and just plain delicious! I’m not kidding when I say that this just might be my favourite salad on the blog so far. And that’s saying a lot because we have a ton of great salad recipes that I’ve published here over the years. I remember when we were testing this recipe, I took a bite as soon I finished tossing it up and I was like ‘good, but not great’. And then this salad went into the fridge for a few hours because there was still time for lunch. 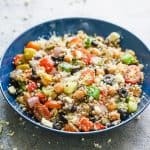 And I took a bite again and my eyes literally popped out because this mediterranean quinoa salad had suddenly become WOW! The dressing had had time to seep into every ingredient and do its magic. The feta had had time to meld too, and the crunchy red onions were less sharp and there was so much balance in flavours. So I deem this ✔️picnic friendly ✔️lunch friendly and ✔️gluten free friendly. Here’s the low down before you make this salad. I think the most difficult part of this salad is cooking the quinoa, which is basically saying that this salad is super easy overall. I’m going to walk you through the do’s and don’t of cooking quinoa. The first step to cooking quinoa is washing it really well under running water. Measure quinoa into a wire mesh colander and rub it between yours hands and wash it a few times. This takes away the bitter flavour that you get sometimes with quinoa. Then add quinoa to a pot along with double the water or liquid. The ratio of quinoa to water is 1:2. Bring this to a boil and then cover and cook on a low flame for 15 minutes till all the water is absorbed and the quinoa is soft and fluffy. While simmering the quinoa, you can choose to add flavoring, salt or cook it in stock or broth for more flavour. Once you have the quinoa cooked, the next steps are ridiculously simple. We make the dressing by adding all the ingredients to a jar and shaking it up with the lid on, and finally adding everything to a large bowl and tossing it up. Then comes the waiting period. Which needs patience. Because you must let this salad refrigerate for at least two hours before serving. This is the only way because the quinoa, chickpeas, tomatoes, onions etc all need time to soak up the dressing. The quinoa and chickpeas absorb any extra liquid that pools down, and this does not become watery! How long does Mediterranean Quinoa Salad last in the fridge? This quinoa salad can be stored in an airtight container in the fridge for up to 3 days. Any more than that, and vegetables like cucumber and tomatoes start to become soggy. This picture was taken a few hours after making the salad and look how fresh and perfect everything still looks 👆I have an easy video below that takes you through all the steps including how to cook the quinoa for this recipe! Add all the ingredients for the dressing to a screw top bottle and shake well till combined. 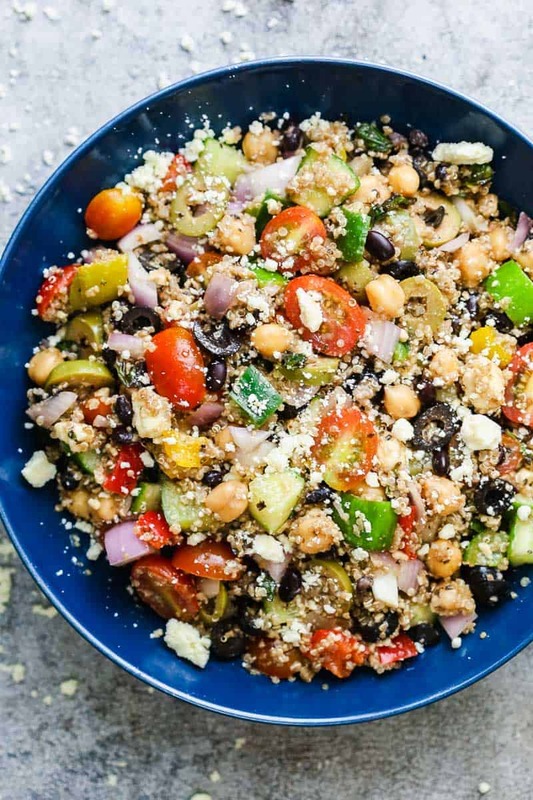 Add quinoa, chickpeas, black beans, bell peppers, cucumber, onions, tomatoes, feta and basil to a large bowl. Drizzle the dressing all over and toss well. Taste and adjust the salt. Sprinkle more crumbled feta on top, and refrigerate for at 2 hours. « Chicken Fajita Quesadillas – Fast and Easy!